The headline 1v1 tournament, featuring some of the best players in the country, will see some of the highest skill action, with the chance to win a share of the awesome prize pot, up to £960 will be up for grabs! This tournament will only be open to anyone with a TUP or BYOC ticket, just sign up at the event before it all starts. This takes place on the Saturday of the event. Brand new at this event is the FIFA Pro Clubs pilot. This new and exciting way to play FIFA and has teams of 4 facing off in a mixture of formats to see who is the best all round team. Be prepared to play 4v4, 2v2 and 1v1s to earn glory for your team. This tournament is brought to you in association with Sweetpatch TV and the FVPA. Make sure you bring your Xbox Live profile on a USB memory stick to take part in this tournament. This takes place on the Sunday of the event. Next up is the classic 2v2 tournament, where for just £10 you can enter a tournament with a friend, and try to win the prize pot – winner takes all! This takes place on the Monday of the event. Each day we will also be hosting a pre-qualifier tournament, where you can earn 4 of the 16 slots in the UK finals tournament on Sunday 30th September at Eurogamer. These will not be the last qualifiers, but it will be your best chance. With other qualifiers taking place in Samsung brand stores in the UK and last minute qualifiers available during Eurogamer itself (both TBA), but the most places will be available to Insomnia attendees. 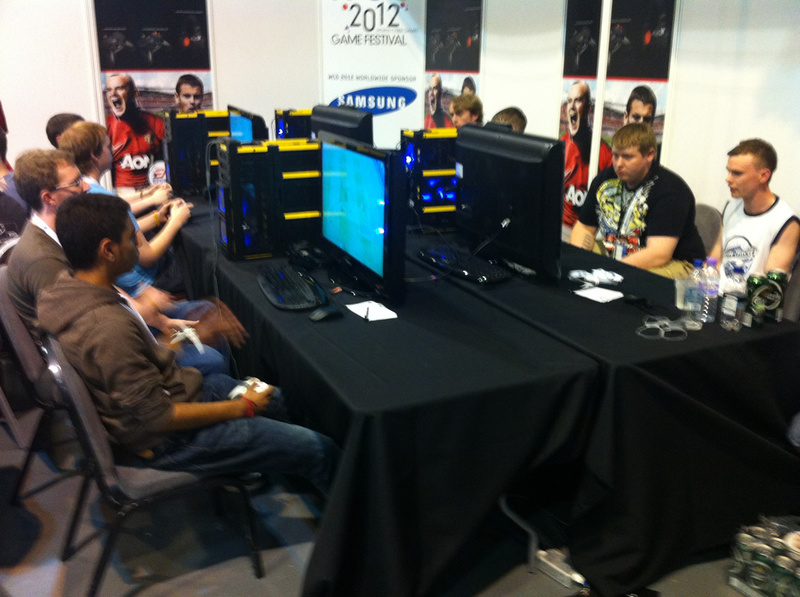 Come and play some casual FIFA12 with some of the best players or your mates at Insomnia! FIFA 12 Free Play Day – open day for any players to come along and play FIFA (FIFA 12 and FIFA Ultimate Team) against their mates and other players. We will also run mini tournaments as and when enough players are in the arena. Get signed up for the FIFA activities for the weekend during this day. World Cyber Games FIFA 12 PC UK Pre-Qualifier 2 – can you earn 1 of 4 of the 16 slots in the UK finals tournament on Sunday 30th September at Eurogamer? Headline FIFA 12 1v1 tournament – Win up to £960. TUP and BYOC ticket holders only. World Cyber Games FIFA 12 PC UK Pre-Qualifier 1 – can you earn 1 of 4 of the 16 slots in the UK finals tournament on Sunday 30th September at Eurogamer? FIFA 12 Pro Clubs Pilot Tournament (based on Ryder Cup format). 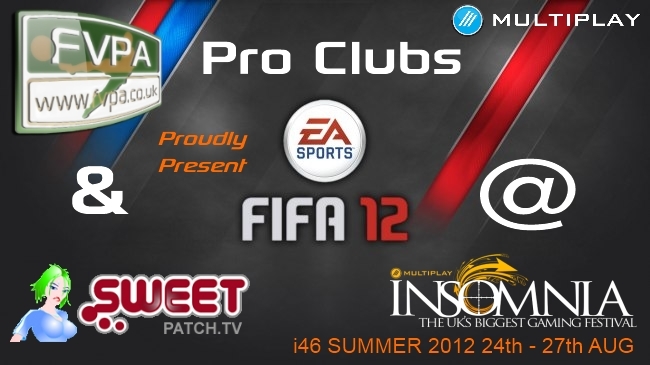 FIFA Clubs teams of 4 players will play in a set of 4v4, 2v2 and 1v1 matches to find the i46 FIFA 12 Pro Club Champions. Free to all event ticket holders. World Cyber Games FIFA 12 PC UK Pre-Qualifier 3 – can you earn 2 of 4 of the 16 slots in the UK finals tournament on Sunday 30th September at Eurogamer? FIFA 12 2v2 tournament – come along and play FIFA with your mates and enter the 2v2 tournament. £10 per team. Free to enter for TUP and BYOC ticket holders. FIFA 12 Free Play Day – Come and play some casual FIFA12 with some of the best players or your mates at Insomnia! The best value if you want to take part in all of the above activity, is to grab yourself a £55 TUP ticket. This includes full weekend entry into the venue, entry into the 1v1 and 2v2 tournaments. And you can take part in the clubs tournament also! With this ticket, you can use our campsite and not have to worry about pesky hotel costs! Its the summer event, so its a great time to take advantage of this! If you have not got your ticket to Insomnia46 yet – head on over to the tickets page and get yours now! If you are unable to attend and to ensure we provide the very best Spectator experience for you from insomnia46, we really would appreciate your feedback on what you would like to see us deliver and then we can prepare for the next month to deliver as much as is achievable for you. So what would you like to see us provide for your Spectator enjoyment?